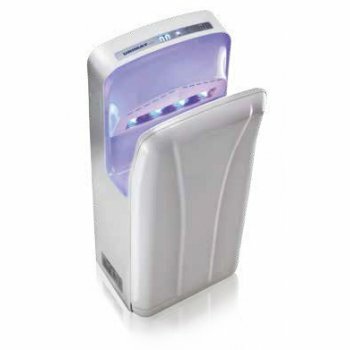 The URIMAT Favorit hand dryer is a high speed jet hand dryer manufactured in ABS plastic. The brushless DC motor provides stable operation and long service life, thus keeping maintenance costs at a minimum. Quick and efficient - The Favorit hand dryer enables high-speed hand drying in no more than 9-11 seconds. User-friendly set-up - Its performance can be set to two different air speed levels, depending on your requirements, and warm or cold air can be selected by turning the heater on or off. Blue LED illumination with timer function - Drying time indicator. Non-contact use - Completely hygienic sensor-activated operation. Straightforward installation - Instantly ready for use, every time. Cost-effective - No need for storing, refilling and disposing of paper or cloth hand towels and significantly reduced cleaning and maintenance costs. Environmentally-friendly and ecological - Easily removable water collection tank and HEPA air filter. Download product brochure and manuals via the "Downloads Available" button above.